Situated on the south green slopes of Bulgaria’s Vitosha mountain region, the sustainable house by Bulgarian firm studio APXE generates more energy than it consumes with an integrated photovoltaic system on its roof. The single floor dwelling sits comfortably in its landscape – the main volume is positioned over the garage, which is dug into the rock at street level. The service spaces and carport area are separated from the main mass, solving many technological and energy problems with thermal bridges. Constructed using a lightweight wooden envelope, the ecological nature of the exterior also offers a warm aesthetic. The framework consists of reinforced concrete for the foundations, supporting frames and roof of the garage, while the outer envelope incorporates steel and timber structures. Laminated wooden beams, columns and a pergola with built-in shading help to form the overall design. 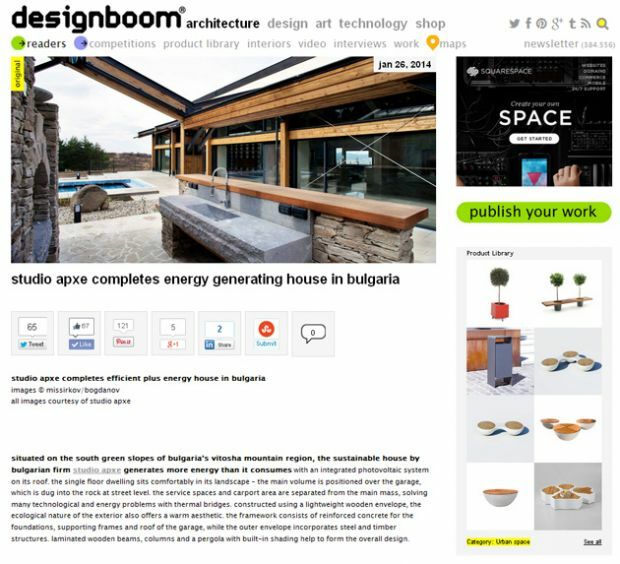 project & construction management: Studio APXE ltd.
Read the article in Designboom.